I find it quite fascinating that in recent decade’s characters in police dramas always have to have a past, which bears down on them making them a little bit neurotic. This never used to be the case. Cops used to be hard men beating up pimps and, if you’re lucky, giving you a lollipop for your troubles. Monk, of course, was all neurotic and played for laughs, but the success of the Nordic noirs is having a telling effect on the writing approach for modern crime dramas. Cardinal: The Complete Season One (2017. 6 eps, 248 min) is a Canadian police show, created by Aubrey Nealon. The series is an adaptation of a collection of book written by Giles Blunt. The show was directed by Daniel Grou and has previously been broadcast on BBC4. So if you missed it you can now pick up the first season on DVD. 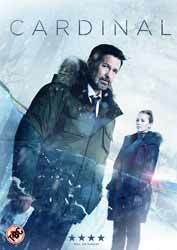 The show ‘s two antagonist are John Cardinal (Billy Campbell) and Lise Delorme (Karine Vanasse). He, of course, is a bit Canadian, noir having become over involved in an investigation about a missing First Nation's girl. So much so that he is initially taken off the investigation. Being our hero, it turns out he was on the right track when her body turns up dead. Put back on the case, he is given a new partner Delorme, who is secretly there at the behest of their boss who thinks that Cardinal is a bent cop. The idea of a bent cop driven to do the right thing would have been an interesting concept, but this is not the one the show goes with. The show is set in Ontario and both the leads are suitably convincing in their roles: Him all brooding and empathetic, and she all cerebral. Together they embark on the investigation which develops as Cardinal becomes convinced that they are chasing a serial killer and DeLorme comes to believe that Cardinal is not bent. There’s nothing truly original here, but the show has some great scenery against which to place the story and the acting is more than satisfactory. The two set DVD set does come with a number of extras. Inside the Location (2 min, 43 sec), Adapting Cardinal to the Screen (2 min, 53 sec), Who is John Cardinal? (3 min, 04 sec). Being short, they do not provide a lot of depth, but considering that TV programmes usually get none they are a welcome addition. The DVD comes with a couple of English audio tracks, DD 5.1 and DD 2,0, there is also English subtitles.